Els primers dies a Leh no et pots moure gaire perqu?? necessites adaptar-te a l???altitud. Ara ja portem tres dies i ens estem morint de ganes de fer una excursi?? a trav? ?s dels Himalayes de dues setmanes. De moment no podem fer-ho, tinc una infecci?? de les vies urin? ?ries complicada, i he d?? ?esperar a que els kilos antibiotics facin efecte. Aqu?? em porta un metge tibet?? molt simpatic i divertit a qui no entenc. Dem?? em faran l?? ?ecografia amb una m? ?quina del s.XIX. Ja ? ?s el tercer hospital que visito (Raimon, ja ho s?? que hauria d?? ?anar a una cl? ?nica occidental, per?? resulta que estic en llocs molt remots). Esperem que els meus bonics ronyons reaccionin al cocktail d???antibi? ?tics i a la bellesa del lloc (quan no tinc febre els porto a passejar perqu?? ho disfrutin). Sempre he odiat els antibiotics, per?? ara els hi dono amor perqu?? m?? ?ajudin a curar-me. Mentre, anem a donar pastanagues al centre de jubilats per burros,?? saludem a les vaques, parlem amb els veins, visitem temples i llegeixo sobre la hist? ?ria de la misog? ?nia, contes Zen i escriptures sanskrits budistes ??? evidentment tradu? ?des a l???angl??s. Ah! I disfruto dels restaurants deliciosos Tibetans!. En la foto estic entre te bon? ?ssim que em prepara la mestressa de la casa i els meus llibres! Tenim una habitaci?? que ? ?s m? ?s gran que?? el meu pis a Barna! Mirant a uns jardins preciosos???
? ?Ryokan, un professor de Zen, vivia de forma espartana en una petita cabana en els peus d?? ?una muntanya. Una nit, un lladre el va visitar per descobrir que no hi havia res per robar. Ryokan el va enganxar I li va dir: ?? ?has vingut de lluny per visitar-me, aix?? que no pots tornar sense res. Si us plau, agafa la meva roba???. El lladre es va quedar de pedra. Va agafar la roba I va marxar volant. Ryokan es va asseure despullat, mirant la lluna: ?? ?Pobre home ??? va pensar ??? ojal?? li hagu? ?s pogut donar aquesta lluna preciosa???.
? 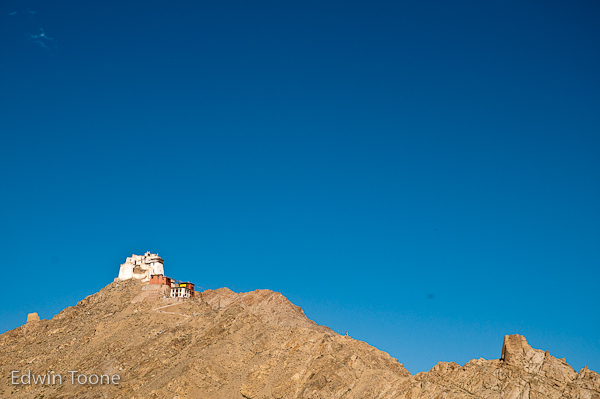 ?It is recommend it on your first days in Leh to keep your action low. High altitude sickness is a serious condition you need to look after. 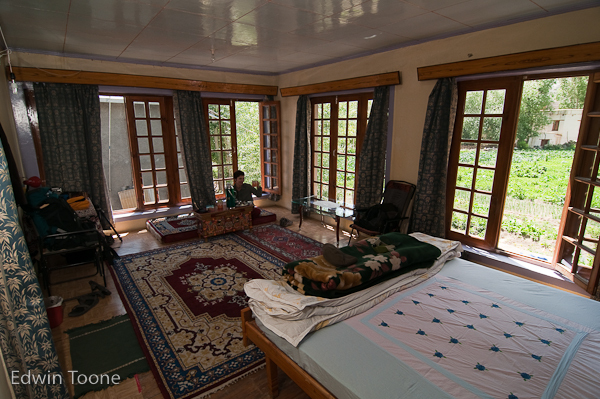 We have been here for three days now and we are dying to go trekking through the Himalayas. For now we have to wait, I got sick with a harsh UTI and we need for the antibiotic cocktail to kick in. Here I have a sweet and funny Tibetan doctor with a complicated English. Tomorrow I have scheduled an echography with a 200 year old machine. It is the third hospital I visit in India (these experiences will be left for another post, it has its own stories!). Let?? ?s hope my beautiful kidneys react to the antibiotic cocktail and to the beauty of the place (when I do not have fever I take them for a stroll so they can enjoy the surroundings!). I always hated antibiotics (as a good follower of natural therapies) but now I send them lots of love so they can help me to heal. In the meanwhile, we take carrots to the Retired center for donkeys, we say hello to the cows, we talk to the neighbors, visit temples and I read about the history of misogyny, Zen tales and Sanskrit scriptures (translated to English). And of course we enjoy the Tibetan food. In the photo I am in our room (bigger than our apartment in Barcelona), enjoying the tea prepared by our host and reading my books. The room looks out on a beautiful and peaceful garden.
? ?Ryokan, a Zen master, lived the simplest kind of life in a little hut at the foot of a mountain. One evening a thief visited the hut only to discover there was nothing in it to steal. Ryokan returned and caught him. ?? ?You may have come a long way to visit me?? ?, he told the prowler, ?? ?and you should not return empty-handed. Please take my clothes as a gift???. The thief was bewildered. He tood the clothes and slunk away. Ryokan sat naked, watching the moon. ?? ?Poor fellow?? ?, he mused, ?? ?I wish I could give him this beautiful moon???. Caram, quina habitaci?? m? ?s bonica, aix?? ja us podeu sentir zen. Aix?? del centre de jubilats per burros, qu?? vol dir? Que els llestos tenen centre propi?